I have a question regarding the ridges on a BSA axle. 3 on one side and 2 on opposing side of axle. If you take a cross section of the axle it's oval where it was struck to create the ridges. Utilizing the flatter side of the oval you will have 3 ridges on one side and 2 on opposing side of axle. Polish axle through progressive grits to final finish and do not remove 3 ridges during the process. The end result will give you 3 polished bumps that, if oriented correctly to face downward, will contact wheel bore and create less surface area friction. The only friction areas will be the inner wheel bore hub edge and the 3 polished bumps. Has anyone tested this idea or have any league or pro racers tried this? Thanks guys. AaronS, I think I am starting to gravitate more to that way of thinking regarding BSA axles. I used to carefully file the ridges down, but now I just remove the flashing and polish the crimp marks smooth. Some folks on the league forums who race in the "Box Stock" division have suggested this is preferable. Other folks will go ahead and cut actual grooves in the BSA axles that take out most of the space occupied by the crimp marks. I couldn't tell you which is better. This is a good Physics lesson. Setting up the nail/wheel bore as suggested does not reduce friction, it simply moves the friction to a smaller area. A downside, It might wear out the graphite sooner. The same is true by cutting a groove in the axle. It does not reduce friction. A possible benefit of cutting a groove in the axle is, if the axle has some bad area where the groove is cut, the cut will remove the bad area. I'm not certain what happens when the axle is raised by running it on the casting marks. Is everything affected in a Negative way? I question this because Doc Jobe uses a Hula Hoop as an example. I invite everyone to read Doc Jobe's "Lecture 4 - Do Smaller Axles Really Go Faster?". If my thinking is Off Base it won't be the 1st time. Doc Jobe's lecture 4 is still a good read. Thanks Vit K and Speedster. I'm going to look into this some more and I will view Doc Jones lecture #4. All 26 of Doc Jobe's lectures can be viewed by going to Hodges Hobby House, Home Page, the paragraph is in yellow. Ok, thank U...That will be helpful. I tried the "leave and just polish the crimp marks" method for this year's Powder Puff race a few weeks ago. Helped 4 girls in a neighboring troop build their cars. All we did was sand off the flashing under the head, and let them go at it with the polishing. My daughter will have some competition next year, as a couple of the girls' parents say they will invest in some wheels/axles as well. But the cars were pretty fast with less-than-optimal body shapes, so I am convinced and will use this method in the future. When you say "aftermarket axles" does this mean you can use .092 stainless steel axles, grooved axles, etc ? Are you racing under rules provided by the Girl Scouts or have you been given rules from a Cub Scout Pack? I'm heavily involved with the Program Director for the Girl Scouts of Western Ohio and I'm curious what rule or rules allow you to use aftermarket axles and apparently wheels. Could you possibly send me a copy of your rules? Thank You. I made the rules. Yes, you can use any wheel/axle you want, as long as they're nail-type and BSA approved wheels. I pretty much did a mash-up of different rules you see online from places around the country. Inspection and Weigh-in will only be held Friday April 20, 2018. If your car is not check in Friday night you cannot race on Saturday. Times for Check in to be assigned at a later date. Check in times will be assigned by Division. •	The overall length of the car shall not exceed 7 inches. •	The overall width of the car shall not exceed 2 ¾ inches. •	The car must have 1 ¾” clearance between the wheels. •	The car must have 3/8” clearance underneath the body so it does not rub on the track. •	The car shall not exceed 5.0 ounces. •	The official race scale that is used at car check-in shall be considered final. •	Please note an unmodified car kit assembled straight out of the box is grossly overweight. •	The official pine wood block must be used. The block may be shaped in any way that is desired. •	Official BSA wheels must be used. The wheels may not be cut, drilled, beveled or rounded. You may remove the seams and imperfections from the wheels. •	The axles may be altered, polished and lubricated. • Axle holes may be drilled into the body of the car as long as all other specs are met. • Coning the hubs, truing the inside edge of the wheel, and removing the outer hub step down is allowed. • Wheel Bore treatment is allowed including polishing, sanding and / or tapping, however wheel bores may not be filled and re-drilled. • Nail type axles are to be used. 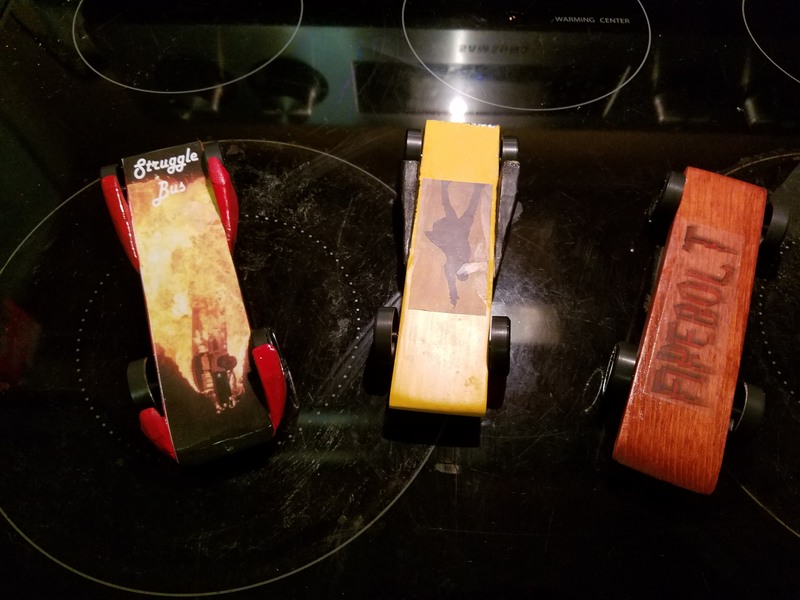 You may or may not choose to use those found in the Official Pinewood Derby kit. Must be dry at time of race. May not use anything that will drip on to track or judging tables. Note: Graphite is a traditional Derby choice of lube. There are numerous “Dry” lubes that go on wet that can be used. Krytox is one that is sold at the Scout Store or online. One bottle will oil cars for an entire Troop for years, as only a drop the size of a pin head is needed for each axle. Thanks for the rules. Those are the most lenient rules I have ever read. They seem to follow the Mid America rules. Would you send us a picture of the winning car? I'm curious to learn if someone takes advantage of all these rules. Wow, Pacfanweb! We wanna race with your rules and have fun tweaking the heck out of our cars! Those rules are great! Oh yeah, I polished the 3 ridges on the axles so they are slightly visible, and got good results with spin time, less noise and vibration. Guess how many issues we had at check-in? ZERO, at least not with the rules. We had the typical few that were overweight and had to drill some holes, and a few "omg the car broke can you help us fix it?" snafus, but we didn't have any issues with people showing up and not being legal. The Boy Scouts that were checking them in had an easy time. Pretty close to Mid-Am rules, with some tweaks here and there. IMO, those are the rules everyone should follow, or close to it. Restricting axles/wheels/rail running does nothing. The people that are going to win will still win. 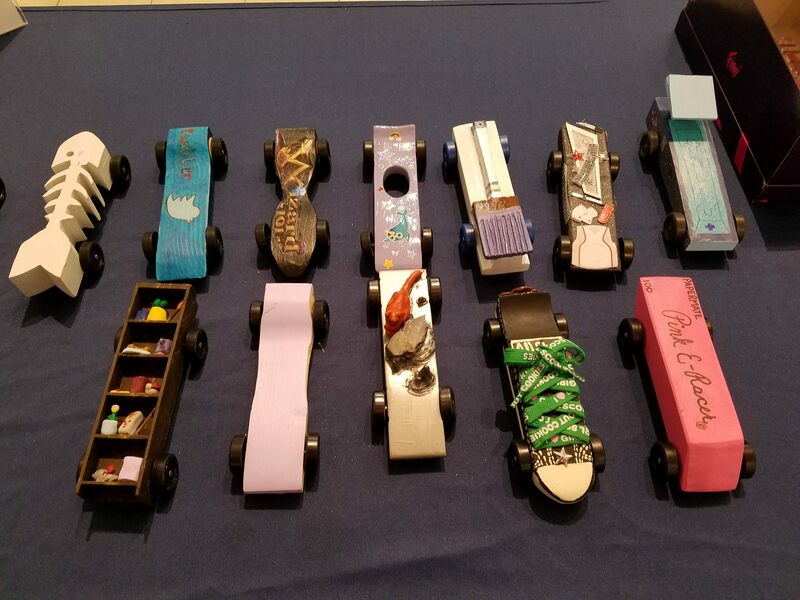 Here are the cars that placed in the last group of teens. 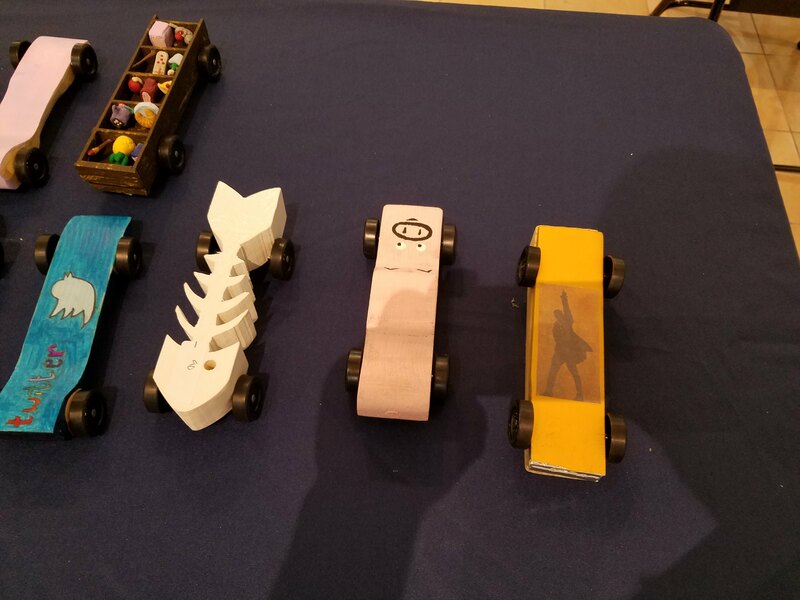 In the above image, the two pink cars (one with the hole in it), the Twitter car, and the brown car...those finished 2nd-5th. Fairly close together in times. They are the troop I helped and used stock parts and our oil prep. The girls did all the axle/wheel work. I cut the bodies and weighted them, they sanded and painted. We tuned them all to 4" over 4'. The "Hamilton" car on the right was the winner. It is a lead car, thin wedge with some really chewed-up Mid-Am wheels on it and aftermarket axles. It is my daughter's car. She did the axle and wheel prep (prepped wheels for Mid-Am last year), cut the body, I routed the weight holes and weighted it. She painted and made the Hamilton logo for it. It was considerably faster than the rest of the field. I attribute that to the better wheels (although they are really chewed up) and her prep work....not to mention the thin wedge design. It is also a graphite car, not oil. We did send that one and two others to Mid-Am this year. As predicted, it was not competitive at Mid-Am due to those damaged wheels. We raced a local derby last year with those wheels that not only was a homemade wood track, but it was outside and the car left the track onto the pavement several times. Wheels were shot....superior to stock wheels in a Girl Scout race, but not fit for Mid-Am. We sent it anyway, because it was built and we weren't going to finish our other entry. The other two cars are a BASX (the brown Firebolt) and our 2nd entry after the Hamilton car in Kid's Graphite, the Struggle Bus: (the red car). BASX car finished 7th. Was an old Powder Puff body and I did my own wheels, kids did the axles. The red car finished 6th in Kid's Graphite. New set of DD "Nitro" wheels and axles. Kids did the prep on both and I assembled. That car was .008 from first place. I feel like tuning it on a track would have made it contend for top spot, if not win outright. In my limited experience in track tuning, I've yet to pick up less than .02 from the initial run after I started adjusting steer.